That poor Iowa cookbook I wrote about on my previous blog from Friday. I wore it out even more and had to add more tape here and there. But I couldn’t put it down all weekend! 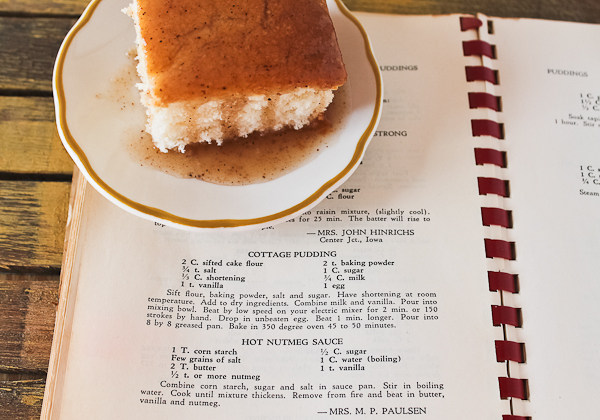 There are so many fascinating old recipes to be made. I selected this particular one because I happened to have all the ingredients on hand and it sounded interesting. There is an entire chapter simply called “Puddings” even though there is not one pudding as we think of pudding. There is even a poem included about puddings. Over five pages you will find plum pudding, date pudding, sauces for pudding, cherry pudding, lemon fluff pudding (that one is next on my list), raisin pudding, and several suet puddings, which I doubt I will ever try. 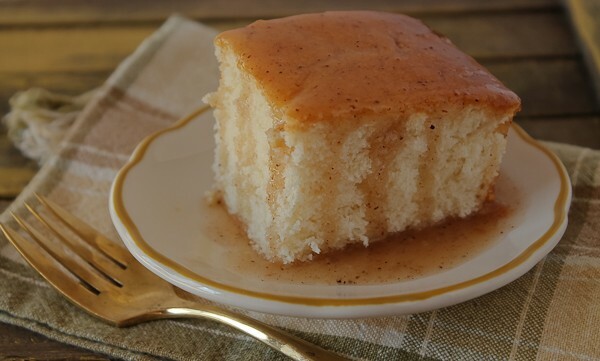 I made the “Cottage Pudding with Hot Nutmeg Sauce.” I love nutmeg. Is there anything more fragrant than freshly grated nutmeg? As I mentioned, there was nothing pudding about the pudding recipes. 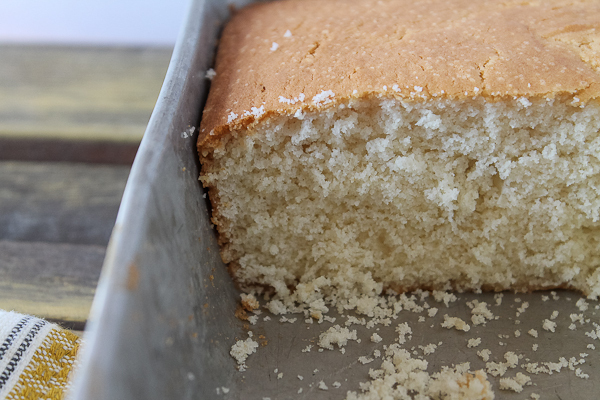 The cottage pudding was actually just a nice white cake with a beautiful soft crumb and a nice golden exterior, baked in an 8-inch square pan. 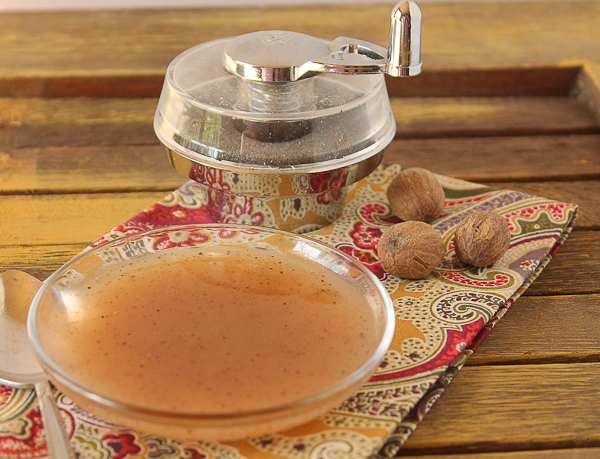 The hot nutmeg sauce was wonderful and so easy to make. Freshly grated nutmeg is best, but prepared is fine too. The recipe calls for 1/2 teaspoon or more; I went on the more side. Mom said it’s great on gingerbread. I can imagine it’s also good on apple pie, pound cake, ice cream, pancakes, waffles, etc. Use your imagination and go gunk something up. But here’s how it looks if you make it like the recipe in the book. Heat oven to 350 degrees. Grease an 8-inch square pan. Sift flour, baking powder, salt, and sugar into mixing bowl. Add shortening and mix to blend into flour mixture. (by hand or in electric mixer). Combine milk and vanilla; add to flour/shortening mixture. Beat on low speed for 2 minutes or by hand 150 strokes. Add the egg and beat another minute. Pour into prepared pan and bake for about 40-45 minutes or until a tester comes out clean when inserted in the center. Place pan on wire rack while preparing nutmeg sauce. Combine cornstarch, sugar, and salt in a small saucepan. Stir in boiling water. Cook, stirring constantly, until thickened. Remove from heat and beat in butter, vanilla, and nutmeg. Serve hot with pieces of warm cottage pudding. 3 Responses to Next Up from Iowa…. I’m with you on the nutmeg, love it! This looks delicious and so pretty! I so enjoy reading your stories. I could easily sit all day and read everything you have written. It brings me such joy. You are so kind, Lisa! Thanks for making my day! It’s people like you who make writing the blog worthwhile.